In today’s world of constant regulation changes, the primary concern for healthcare foodservice operators continues to be centered on achieving higher patient satisfaction scores and outstanding level of service. Following closely behind are efforts to reduce operating costs, improve productivity and implement sustainable practices. All while maintaining a high level of food quality, of course. Facilities need to be judicious when making decisions to reduce costs to ensure that the patient experience continues to be as positive and as pleasant as possible under the circumstances. One way facilities are achieving this is by incorporating reusable items into their daily operation. Reusable items are an appealing solution because they provide savings, sustainability and efficiency benefits. An increasingly popular solution is the implementation of reusable lids for meal delivery mugs and bowls. These reusable lids eliminate the need of continuously having to purchase disposable, uneconomical lids that will eventually make their way into our landfills. It is estimated that the total amount of general (non-hazardous) waste generated by health-care activities is about 80% compared to domestic waste; which means sustainability efforts will continue to be top of mind. The Camrack Wash-and-Store System keeps reusable lids organized and reduces loss. The lids fit perfectly into the rack for convenient one-step washing and storing. 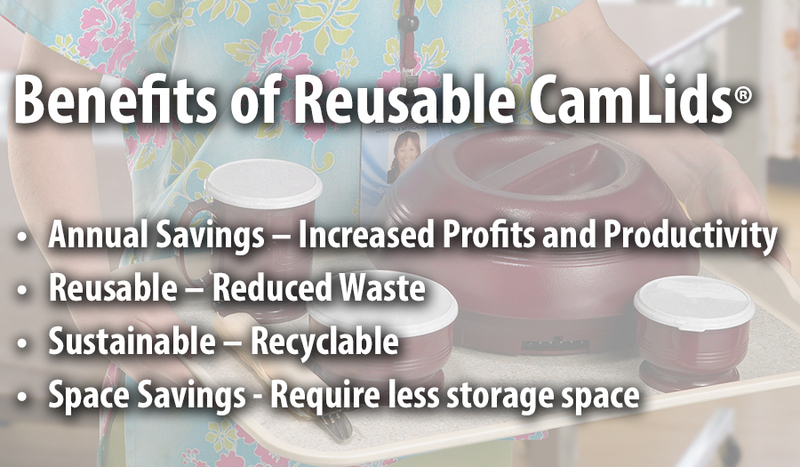 Discover how much you can save by visiting www.cambro.com/savemoney. To learn more about Cambro healthcare products www.cambro.com/healthcare or contact your local Cambro Healthcare Specialist.